An important prosperity scenario is expanding a personal training business by employing multiple personal trainers. This is possible by hiring them as employees or by connecting them to the business as self-employed contractors. Naturally the consequences differ greatly. One of the most important interventions is related to how an exercise is performed. The personal trainer must be able to intervene to help the client demonstrate safe and effective exercise technique. Up to this point, the discussion has focused primarily on the general structure and function of the endocrine system. Normal bodily function depends on the timely release and inhibition of a variety of hormones as they work together to bring about important actions at their target organs. The roots of periodisation come from Hans Selye’s model, known as the general adaptation syndrome, which has been used by the athletic community since the late 1950s (Selye 1950). Selye identified a source of biological stress referred to as eustress, which denotes beneficial muscular strength and growth, as well as a distress state, which is stress that can lead to tissue damage, disease and death. 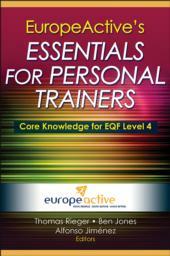 Endorsed by EuropeActive, this text includes best practices and scientific fundamentals related to the on-the-job responsibilities and duties of qualified personal trainers. The content applies to level 4 of the European Qualifications Framework. Applied reference book for those working toward level 4 of the European Qualifications Framework (EQF) and for personal trainers striving to comply with the latest industry standards and best practices. Alfonso Jiménez, PhD, CSCS, NSCA-CPT, FLF, is a professor of exercise science and health and the executive director of the Centre for Applied Biological and Exercise Sciences at Coventry University (UK) and a member of the scientific advisory board of UKActive Research Institute. Previous roles include professor and dean of the faculty of health, exercise and sports science at European University of Madrid (Spain) and main academic leader of the Real Madrid Graduate School; professor, deputy dean and head of school of sport and exercise science at Victoria University in Melbourne (Australia); professor and headd of the centre for sport science and human performance at the University of Greenwich in London (UK); and chairman of the standards council at EuropeActive. He was awarded honorary membership of EuropeActive in recognition of his outstanding service. He is currently a visiting professor and international research associate at ISEAL at Victoria University, visiting professor at the University of Greenwich and chair of the research and dissemination commission at the Healthy & Active Living Foundation in Spain. Before entering academia, Dr. Jiménez focused on management, research and sales in the fitness industry.